The historical setting for Isaiah 7 concerns the efforts of Syria (Aram) and Israel (Ephraim, the northern kingdom) to form an alliance to attack king Ahaz of Judah (cf. 2 Kings 15:37). Some refer to this as the Syro-Ephraimite coalition against Judah. The southern kingdom over which Ahaz ruled is referred to as the “house of David” twice in this chapter (7:2,13), and again in Isaiah 22:22. This chapter clearly mentions three distinct nations or governments – Syria, Israel, and Judah (the house of David). According to the Bible, the throne of David was established forever (2 Samuel 7:11-15). Christians understand that Jesus Christ is the final fulfillment of that promise (Luke 1:31-32; Acts 2:25-36). 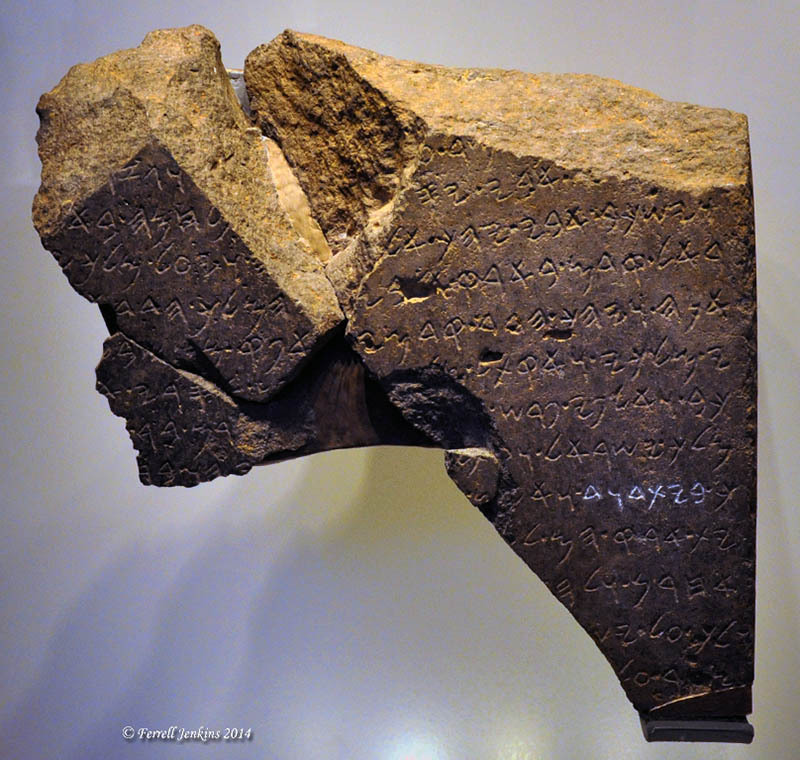 Three fragments of an Aramic inscription were found at Tel Dan in 1993/1994 mentioning the king of Israel, the “house of David” and the Aramean (Syrian) god of storms and warfare, Hadad. You may recall that some of the Syrian kings were named after Hadad (e.g., Ben-Hadad, 1 Kings 15:18). This document probably refers to a different historical setting, but the kingdoms are the same: Israel, Syria, and Judah (house of David). Because all of the kings of Judah from David to the carrying away into Babylon are of the family of David, It is appropriate to refer to the house of David as the Davidic dynasty. The Tel Dan inscription is displayed in the Israel Museum in Jerusalem. The Tel Dan inscription displayed in the Israel Museum. The term “houseofdavid”, written right to left, is highlighted in white. Photo by Ferrell Jenkins. This entry was posted in Archaeology, Bible Places, Bible Study, Israel, Old Testament, Photography, Travel and tagged house of David. Bookmark the permalink. Thanks to you both. Delighted to have the link to your good article. It is ironic. This is great, Ferrell. I’m glad the Israel museum is allowing us to photograph again! I love irony of the Dan Stele, discovered in the city where Jeroboam tried to downplay the “House of David” (1 Kings 12:26).